THE NEXT BIG [BOX SET]! Heads up: “Brock Lesnar – Eat. Sleep. Conquer. Repeat.” is now live to pre-order for fans in the United States here on Amazon.com. For fans in the United Kingdom, it’s here on Amazon.co.uk, where the DVD and Blu-ray should be available to pre-order any day now. The BIG news: included among the first set of product listings is a newly unveiled BROCK BOX SET, similar to the “Macho Man: Randy Savage Story” Collector’s set released back in 2014. Since day one, Brock Lesnar has conquered every obstacle in his path of destruction. He has claimed championships, taken opponents to Suplex City, and put an end to Undertaker’s undefeated WrestleMania streak. Pre-order the BROCK DVD now by clicking here to Amazon.com. The Blu-ray will pack in all of those monstrous matches and new video packages too, plus on top will be 5 matches presented as Blu-ray exclusives, bumping up the runtime to approximately 8 hours and 30 minutes! Included in the bonus matches are Brock’s matches from WWE Network specials “Beast in the East” and “Roadblock” (never put out on DVD). In addition to the standard Blu-ray, a Steelbook Blu-ray edition will be released nationwide in the UK and as a Best Buy exclusive in the United States. The Steelbook packaging will feature exclusive artwork not present on any other version of the Home Video release – check it out again below. Pre-order the BROCK Blu-ray now by clicking here to Amazon.com. And just revealed as of today is a “Collector’s” box set! The big box set, confirmed so far for the United States, includes the 2016 DVD, Brock Lesnar memorabilia and other goodies exclusive to this release. Hinted at in the prototype image below is an item that’s possibly hand-signed by “The Beast” himself and a piece of the WrestleMania 32 ring canvas! Pre-order the BROCK box set now by clicking here to Amazon.com. – USA: October 11th. The BROCK DVD & Blu-ray has just been listed here on Amazon.com. – UK/Europe: October 17th. The BROCK DVD & Blu-ray has just been listed Amazon.co.uk. – Australia: TBA. Look for your chance to pre-order it very soon at Madman.com.au. The Brock box set will be mine! the reason why they arnt adding the bluray to the pack is cause you get all that extra crap the gloves card and all that. so they figure the dvd is enough. even in 2016 most dont have a bluray player so dvd is only way, i really wish people would let this bluray fetish go already. We are in 2016, unless you are surrounded by cavemen, everyone is already on Blu-Ray with 4K taking over. Its like releasing a VHS special edition…in 2005 when VHS was dead, just like DVD is now. Some people are afraid of change. They’re very content with living in the past and don’t like moving forward. That’s the only reason I can see people still clinging to DVDs. DVD…….ugh. Should be bluray. If you haven’t bought a bluray player yet tough luck. If you want it on blu ray then ‘tough luck’…. I want it on Betamax! And I want it on Kodak 8 mm film! The picture doesn’t look like it’s been really autographed by Brock. More like a facsimile “signed”. But it could just be what was used for the picture. Does anyone know if it’s a real autograph? Brock is a notoriously hard signature to get. 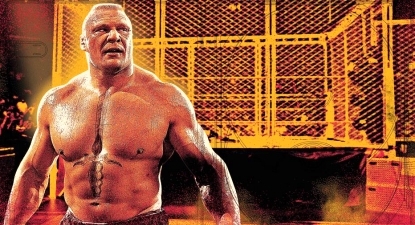 So if it is – i’ll definitely be grabbing the “Brock Box”! If the steelbook blu-ray was in the box instead, I’d honestly buy it. Don’t know why they only put the DVDs in there instead of Blu-rays. I don’t know why they aren’t offering the Collector’s set in a Blu-ray configuration as well. Same situation as the Macho Man deluxe set…it’s disappointing but it’s not like WWE has been a dependable supporter of the Blu-ray format here in the USA. When they said similar to the Macho Man set I thought they meant it would contain Brock’s previous DVD set also. Not really know, I didn’t mean for myself. And I don’t know why that’s so impossible if they did it that time for the Macho Man set. The WM 32 box set is still avaliable, which makes me wonder, if there at all is a market for boxsets containing HD filmed material….released on SD media? I don’t see how this Brock release should do it any better, but then again..really anything is better than BoringMania 32. Plenty of idiots still buying DVDs, sadly. Tell me about it. LOL. What about buying a dvd suggests a lack of intelligence? Doesn’t make them idiots. Just means that they’re happy enough with the huge leap from VHS to DVD, rather than the comparatively minimal leap from DVD to Blu-Ray. Some of us care more about the content of what we’re watching than believing we’re in the same room as what’s going on. “…minimal leap from DVD to Blu-Ray”? Let’s see. A standard blank DVD (in highest quality XP mode) can hold about 1 hour of video(2 hours on a dual layer disc). A standard blank VHS tape (in highest quality SP mode) can hold about 2 hours of video(3 hours on a T-180 tape). And a standard blank Blu-ray(25GB) can hold about 2 hours in the highest quality(4 hours on 50GB and 8 hours on 100GB). And that’s not even getting into the difference in audio and video quality. The highest quality commercial VHS is not that drastically different from a commercial DVD. Whereas the difference between DVD and BR is very different. And I’m not even gonna mention 4K Ultra discs because that’s a whole different level of quality.